More than two years after it launched, a spacecraft called OSIRIS-REx is approaching its target, an asteroid named Bennu. Scientists hope that rock samples from Bennu will provide insight into the likelihood of life on other planets, as well as the risk the asteroid poses to earth. PBS NewsHour science correspondent Miles O’Brien explains the delicate“touch and go” method of sampling the asteroid’s surface. A more-than-two year journey is about to reach its target next week, when a NASA spacecraft launched in 2016 connects with an asteroid hurtling through space. Science correspondent Miles O’Brien has an inside look at the mission of the OSIRIS-REx probe and the researchers behind it. It’s our weekly science and technology series, the Leading Edge. Here’s a couple of pictures we got today for just eye candy. Briefings like this are becoming more frequent and intense for this team of scientists and engineers at the University of Arizona. More than two years after it launched, their spacecraft is homing in on an asteroid named Bennu, which they hope will tell them more about our origins and our possible demise. It’s one of the most potentially hazardous asteroids that we know of in the solar system. Planetary scientist Dante Lauretta leads the mission. Its name is a mouthful, Origins, Spectral Interpretation, Resource Identification, Security, Regolith Explorer Planning, or OSIRIS-REx. 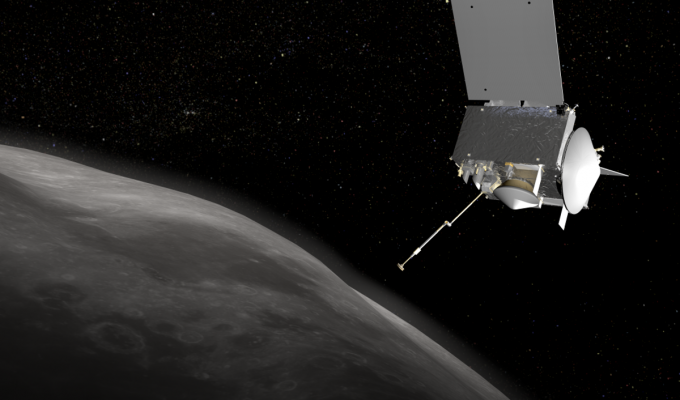 OSIRIS-REx will be the largest sample return from a planetary body since the Apollo missions, so we really are redefining the next stage of planetary exploration. OK, the contingency sample is down. Apollo astronauts collected 842 pounds of lunar rocks from 1969 through 1972, which scientists are still actively analyzing today. But, beyond the moon, sample return missions remain the province of robots. In 2006, NASA’s Stardust mission returned a milligram of dust from the tail of the comet. In 2010, the Japan’s Hayabusa mission brought back a few micro grains of an asteroid, even though the probe’s collection device failed. The OSIRIS-REx team is hoping for a much bigger payload, at least 60 grams, or about two ounces, of loose asteroid rock, about the weight of a Snickers bar. Scientists believe carbon-rich asteroids like Bennu carry the key ingredients of life, like amino and nucleic acids, which make up our proteins and DNA. If we can show the building blocks of life are contained in these asteroids, then those got delivered all over the solar system, and we don’t think the chemistry of our solar system is vastly different than the thousands of other solar systems that we are finding elsewhere in the galaxy. So the likelihood that life is out there, I think, goes up exponentially. Landing on an asteroid is a big engineering challenge. Bennu is about 500 meters, or 1,600 feet, across. It generates only a wisp of gravity, about 100,000 times less strength than that of Earth. So the team has devised a novel sampling method. Instead of landing, the spacecraft will touch the surface of Bennu ever so briefly, pogo stick-style. It’s a touch and go just long enough kick up and grab some dust. Carl Hergenrother leads astronomy working group. So, about 30 meters up, we kind of go into a freefall. We slowly fall with our arm extended out. As soon as it touches the surface, there’s canisters of nitrogen gas that will blow into the surface. It will kick up all of the material in the surface, which then gets caught by the air filter. The whole time this is going on, the spacecraft continues the kind of descend and shorten up the shock absorber. And then we kind of like pogo stick off. But the team is not rushing into this bold maneuver. Once OSIRIS-REx is in orbit around Bennu, they will spend more than a year scanning it with various instruments to increase their chances of success. Selecting a good sample site is a top priority for lead imaging scientist Dani DellaGuistina. We’re very excited about starting to look at Bennu with our color imager. And, in particular, we’re going to be seeing how rocky the surface is. So, the amount of rocks or boulders on the surface is going to have a really big impact on where we chose to sample. While the team searches for a touchdown site, they hope to measure how the asteroid tumbles through space, which slightly alters its orbit. The goal, a better understanding of how big a threat Bennu poses to Earth. The odds it’s on a collision course with us in the next 200 years are one in 2,700. If Bennu hit Earth, it wouldn’t send us the way of the dinosaurs. The asteroid that did that 65 million years ago was about the size of Manhattan. But smaller asteroids are not to be ignored. In 2013, an asteroid 66 feet in diameter buzzed the Russian region of Chelyabinsk. It didn’t impact the surface, but caused numerous injuries, mostly from the thousands of windows it shattered. Empire State Building-sized Bennu would cause widespread regional damage if it hit the surface. We are paying attention to Bennu. We take it — it’s important to understand this risk and to mitigate the risk. Of course, even smaller fragments of asteroids hit Earth all the time in the form of meteorites. So why is it scientifically necessary to return a piece of one still in space? What actually survives passing through the Earth’s atmosphere to hit the ground may not be representative of all the material that is up there. Most of a meteorite, 99 percent of its mass probably burns off. So, there’s a good chance of what you’re actually finding is just the strongest material. So, by actually going to an asteroid and bringing back everything we can from at least this little area of the surface, you end up with an unbiased sample. If all goes as planned, OSIRIS-REx should leave Bennu with that sample in March of 2021, returning it to the Utah desert in September of 2023. And for scientists, that’s when it’s game on. The precious cargo will keep them busy for many years, trying to understand the origin and possible ubiquity of life. For the “PBS NewsHour,” I’m Miles O’Brien in Tucson, Arizona. Banner image credit: NASA Goddard Space Flight Center.